A try for Melrose, on their way to a 35-7 win at Poynder Park, Kelso, over Gala in last season's Booker Border League final (picture by Gavin Horsburgh Photography). The Border League has announced the continued sponsorship of the oldest Rugby Union competition in the world by the UK’s leading food wholesaler, Booker. The competition, which will again be played as two groups with a final between the group winners, will be known as the Booker Border League. 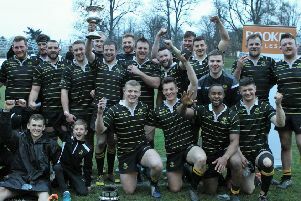 This season’s contest starts with a game between Hawick and Gala on August 19 at Mansfield Park, with a second game on August 26 at the Gytes between Peebles and Jed-Forest. Both will have a 3pm kick-off. With four Border League clubs playing in National 1, there is the intriguing situation of double headers – results counting for Booker Border League points as well as BT National 1 points, when Kelso visit Selkirk on October 14 and when Gala hit Jed-Forest on November 4. The groups are: Group A – Gala, Hawick, Jed-Forest and Peebles. Group B – Kelso, Melrose and Selkirk.